As you know, last week’s show was an “encore” presentation of the 20 November 2011 show because I was in Sacramento (well, technically Rancho Cordova) for the 31st annual West Coast Ragtime Festival. This week, you get a benefit from that trip which is that this week’s show is a “recap” of the festival, presenting vintage recordings of some of the songs heard at the festival, along with some interesting information about the event. Several of the performers are spotlighted, but I’m sorry they couldn’t all be featured because they were all spectacular. Unfortunately, because of the structure of the festival, it’s only possible to take in a maximum of about 20% of everything that’s offered. 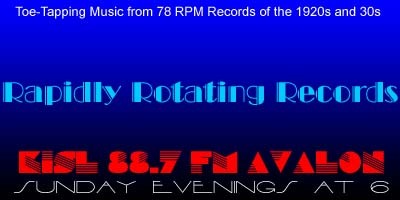 Per usual, there are at least a couple of records making their RRR debut. If you enjoy the show, please let us know by leaving a comment on the website or the Facebook page or sending an email. And remember, your requests and topic segments are always welcome. As always, just click on the link below to instantly listen streaming online and/or download the show. Heartaches – Jack Leon and His Band / Les Allen, v.
Until The Real Thing Comes Along – Leo Reisman AHO / Larry Stewart, v.
Marie – Tommy Dorsey AHO / Jack Leonard & Chorus, v.
Willow Weep For Me – Ted FioRito AHO / Muzzy Marcellino, v.